Sandhill Cranes are dancing and singing their courtship songs all across Oakland County. Their leaping, wing-flapping dance moves are one of the finest and perhaps most astonishing shows of nature for those that are lucky enough to witness their exuberance for life. The spectacular performance takes one’s breath away. An early morning solo hike near the entrance of Rose Oaks County Park presented me with an opportunity to watch that ritual from a crouched position among dry cattails with Red-Winged Blackbirds as my companions. A month earlier, the hauntingly beautiful and extraordinarily loud bugle-like calls of Sandhill Cranes in flight drew my attention on an early morning hike to greet the sunrise at Addison Oaks County Park. A few seconds later, a pair of these magnificent gray-bodied, crimson-capped birds came into view. They crossed over ice-covered Buhl Lake and descended towards a nearby snowy field. It was a promise that spring would return and now it has. 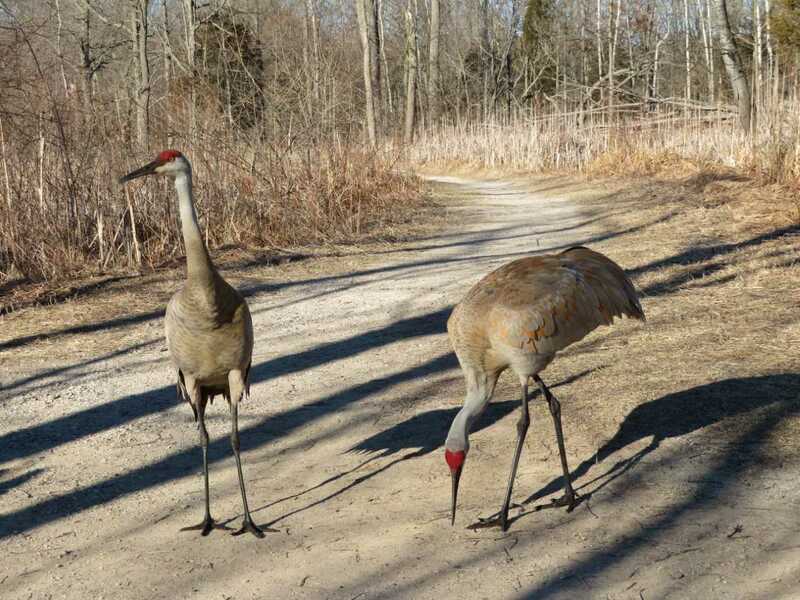 The Sandhill Cranes of Kensington Metropark are well acclimated to human activity and some nest very close to trails and along the shoreline of Wildwing Lake. Multiple generations of Sandhills have used Kensington as their breeding habitat. Quiet strolls along the nature trails are likely to bring close encounters with these birds. 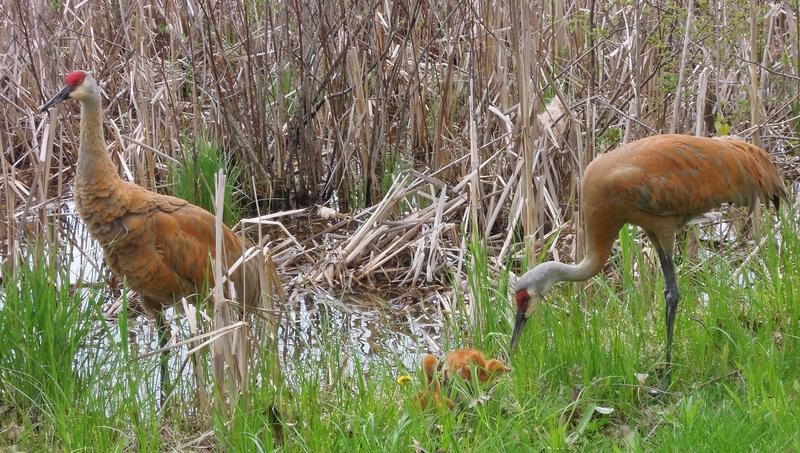 A few words of caution: don’t approach or try to feed them, and of course stay away from a Sandhill Crane on its nest. Sandhill Cranes can deliver a powerful kick or speedy poke with their long bill. 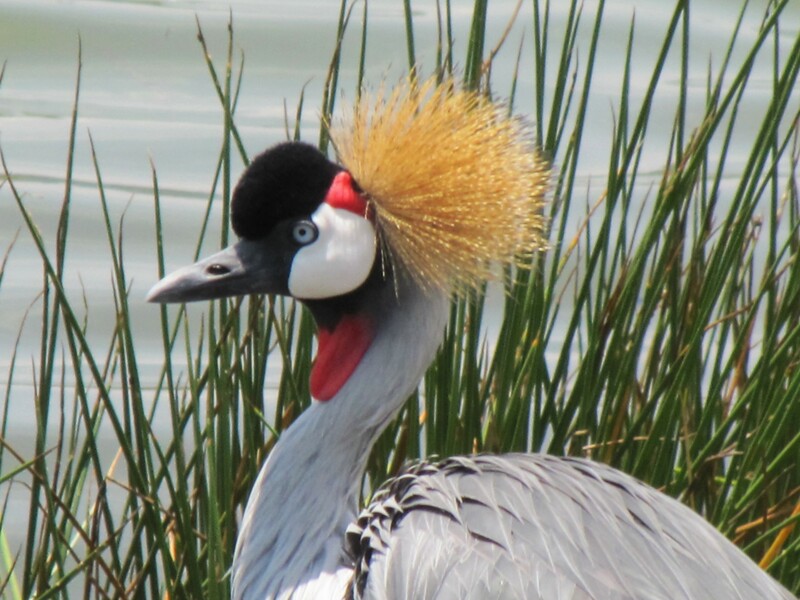 Our native and less flamboyant Sandhill Cranes are easily distinguished by their distinctive red crest from our large local wading birds such as Great Blue Herons and Great Egrets. One of the easiest ways to distinguish the birds is to remember that herons fly with their necks curved and cranes fly with their necks straight. 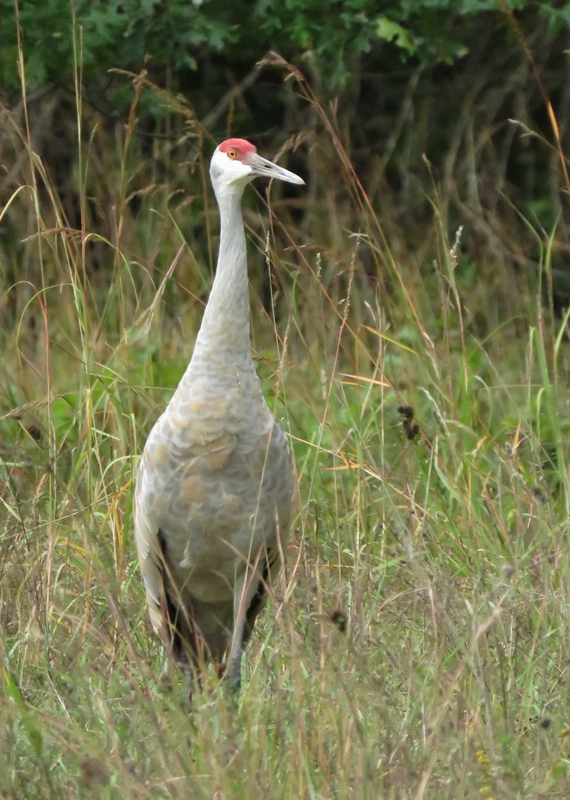 Sandhill Cranes are adaptable when it comes to creating a nest and feeding. They use what nature provides and in our area it’s mostly cattails, sedges, and dried grasses. The nest is over a yard across and about five inches high with a depression to hold the eggs, usually two. Nests may be built on the shoreline, while others create large nesting mounds in very shallow water near the shore. The “chicks,” properly known as colts, are born about 30 days after incubation starts and have fuzzy, yellowish-brown feathers that help camouflage them while they are flightless. Both the adults and rapidly growing colts are omnivorous: feeding on seeds, tubers, grasshoppers, and bugs. The adults will also take snakes, frogs, and meadow voles. If they encounter low to the ground nestling birds they too, may be added to the menu. Pictured below are two early returning Sandhill Cranes visiting rural bird feeders scrounging for seeds and grains. Rapidly growing colts will stay close to the adults and remain with them during autumn migration. A few years ago, while on routine patrol at Addison Oaks County Park, Lt. Kelly Sexton of the Oakland County Sheriff’s Office captured this great image of newly hatched colts feeding with their parents. Life is not always easy for Sandhills, even when food is abundant and excellent nesting habitat exists. Coyotes, raccoons and crows will try for the eggs and colts, but the adults will usually stand their ground and try to ward them off by spreading their wings, hissing, advancing and kicking. Occasionally, a coyote will ambush an adult crane. Sandhill Crane hunting is illegal in Michigan. The Sandhill Crane is a migratory bird, whose protection falls under the Migratory Bird Treaty Act. As the days lengthen, why not make this spring the season to enjoy our Sandhill Cranes, Michigan’s oldest and largest bird species. Opt outside for a chance to view the iconic bird that has found habitat to its liking on the wilder side of Oakland County. Thanks! I could have rambled on for hours and my pulse soared when I was close enough to film the short video of the dance. Jonathan, loved the video – and I learned my “something new” about chicks properly being named colts. Thank you for sharing this!